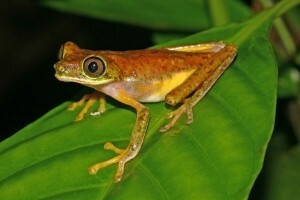 Some of the institutions that are participating in AArk’s Leap Day event in 2012 have provided updates on their amphibian conservation projects. You can support these institutions, and the valuable conservation work they participate in, by visiting them on, or around Leap Day (February 29th) in 2012. 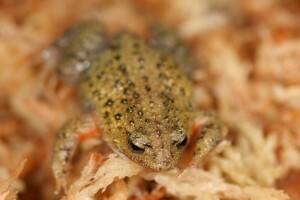 Our captive breeding and conservation program for the Cuban Long-nosed Toad, Peltophryne longinasus, began in 2003 First attempts to create husbandry protocols, were only partially successful due to some problems in toads apparently linked to water quality (hard water in captivity versus soft water in the wild) or UVB suppression. Hypercalcemia developed in toads after two or three years of maintenance in captivity. After support from Amphibian Ark, a new facility is being created for this and other endangered species. Water quality is assured by the use of a deionizer, which provides soft water. Water is reconstituted by adding salts (Zippel´s formulae), and kept soft and slightly acidic like that found in the natural habitat. The first step for the starting facility was the creation of a small insect room to breed tropical house crickets (Gryllodes sygillatus), cockroaches (Blatta orientalis), lesser-mealworms (Alphitobius diaperinus), springtails, and other species. Long-nosed toads require an aquatic habitat, with well-filtered and slightly moving water. In the new facility we are combining a fluorescent lamp designed to aid plant growth (Flora Glo) with a UV lamp (Repti Glo 5.0). Terrariums are equipped with HOBO data loggers, for long-term monitoring of humidity and temperature. Draining systems and automatic control of lights has been installed throughout the facility. Female toads are ready to lay eggs every one or two months, with reproduction occurring throughout the entire year, but especially during the summer time (April to October). Contrary to other frogs and toads, Long-nosed Toads avoid breeding on rainy days, probably because it represents a risk when stream water flow increases in speed. Eggs are attached to submerged roots, plant stems, and pine needles. Each female lay up to 350 eggs. Tadpoles develop in one or two months and sexual maturity is reached in six to eight months. The Lemur Leaf Frog, Agalychnis lemur, remains one of the world’s most Critically Endangered amphibians. During a re-assessment of Leaf Frog classification, based on DNA profiling, the species has now been moved from the previous genus Hylomantis to that of Agalychnis. Other work has recently highlighted a significant difference between Panamanian and Costa Rican populations, the extent of which is similar to that found between other completely different species of Agalychnis. This has clearly indicated the necessity to manage animals from the different populations separately. Lemur Leaf Frog, Agalychnis lemur, showing night coloration. Photo: Matt Wilson/Manchester Museum. The live specimens that are maintained at The Manchester Museum in the UK are from one of the last remaining populations in Costa Rica, and the captive breeding program there was first started in 2001. Over the years, young animals bred at the Museum have been distributed to zoos around the world, including Bristol Zoo in England, the Vancouver Aquarium in Canada, and the Atlanta Botanical Gardens in the US. Research and engagement work at Manchester Museum continues to support and highlight the need for focused amphibian conservation with this species. Within the UK, Bristol Zoo has been highly instrumental in taking captive breeding of the Costa Rican animals forward, and has also invested in a special amphipod dedicated to the species and situated at the Zoo. Many specimens have been produced at the Zoo and this year 40 specimens were sent to Cologne and Antwerp Zoos in Europe. Bristol Zoo has also produced husbandry guidelines for the species, and a research project involving a student from Manchester University working at the Berkshire College of Agriculture aims to develop specific guidelines for best practice in tadpole rearing. In situ conservation for the population has been fully supported and built upon by the Costa Rican Amphibian Centre, where the wild population continues to be assured through excellent habitat modification and site protection. Although all frogs of the genus Agalychnis are now protected under CITES, stocks of this species have recently appeared in the trade. However, these have only been made available to hobbyists via highly reputable suppliers also interested in supporting conservation. It is hoped that in the near future a focused taxon group will be in a position to establish a full genetically managed captive population of Costa Rican Agalychnis lemur. A new research project has been proposed to support the establishment of this, which first involves studies to develop a genetic marker system for the species at the required level, as PCR primers for microsatellites are lacking for this species. Several institutions are involved in this new project, although further support is required and collaborative opportunities now exist. The cost of the necessary genetic research work is in the region of £10,000, and any support towards this amount would be greatly valued. If any private individual or organization would kindly consider funding at this level they would be extremely grateful, as it would provide be a major step towards enabling them realizing their vision for the conservation of this Critically Endangered species. For further information please contact: Andrew Gray, Curator of Herpetology at Manchester Museum, who is leading this project: andrew.gray@manchester.ac.uk. The Oregon Spotted Frog, Rana pretiosa, is the most endangered amphibian in Canada. Found only in British Columbia, this frog is listed as Critically Endangered under the federal Species at Risk Act and is red-listed (i.e., in danger of extinction) in British Columbia. Historically, Oregon Spotted Frog populations occurred throughout the Fraser Valley, from South Surrey to Hope. Currently, there are only three breeding populations of Oregon Spotted Frog left in British Columbia, with less than 300 breeding females in total. The primary cause for the decline of Oregon Spotted Frog has been the loss of wetlands as the Fraser River floodplain was drained for agriculture. The impact is even greater when agricultural land is further converted to housing and urban development. In recent years, additional threats to the few remaining Oregon Spotted Frog populations also include pollution, invasive species such as bullfrogs, mining, and changed hydrology due to water level management. Oregon Spotted Frogs, Rana pretiosa, in amplexus. The Vancouver Aquarium assists the Oregon Spotted Frog Recovery Team by maintaining a captive insurance population of the species. Photo: Lee Newman. The Oregon Spotted Frog Recovery Team, a diverse group of biologists and land managers, is coordinating efforts to conserve, manage and recover Oregon Spotted Frog in Canada. The team’s key goals for the next 10 years are to maintain and expand the existing populations, as well as establish six additional self-sustaining populations in British Columbia. The Vancouver Aquarium assists the Oregon Spotted Frog Recovery Team by maintaining a captive insurance population. This population now consists of 33 genetic strains of 1-10 frogs each. Additional eggs are collected each year to increase genetic heterozygosity. 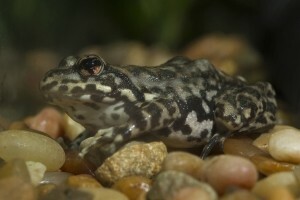 In 2010, the Vancouver Aquarium bred the Oregon Spotted Frog for the first time in captivity. A combination of providing a seasonal photoperiod and temperature regime was crucial to the Aquarium’s success. The few frogs that were mature enough this first year to spawn (2-3 yr olds) produced 291 tadpoles. Of these tadpoles, 68 metamorphs were released to a once occupied site in spring 2011. Breeding was again successful in Spring 2011. With more frogs breeding. over 9,000 eggs were produced. Of the approximately 3,000 tadpoles hatched, 300 were used for enclosure survival studies, 300 were retained for radio tagging studies, and 50 were retained by the Aquarium to produce F2 generation animals. The rest of the tadpoles (over 2,000) were released along with the 68 metamorphs in spring 2011. In 2011, the Vancouver Aquarium worked with a researcher, Vance Trudeau from the University of Ottawa, to test the AMPHIPLEX method which uses a combination of 2 hormonal substances to induce and synchronize spawning. Results suggest that hormone induction synchronized timing of spawn but did not increase spawning events or number of eggs. Frogs that were not environmentally cycled did not spawn. 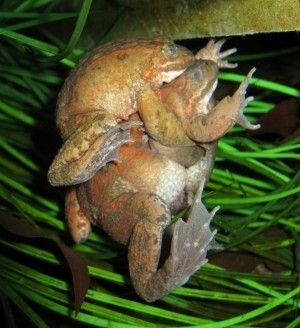 With many more frogs maturing over this winter, we expect to produce a magnitude more young in 2012. AMPHIPLEX will be tested again in 2012. The Oregon Spotted Frog Recovery Team includes members from the BC Ministry of Environment, BC Ministry of Forests, Lands, and Natural Resource Operations, Canadian Wildlife Service, Department of National Defense, Seabird Island Band, District of Kent, Fraser Valley Regional District, Greater Vancouver Zoo, Vancouver Aquarium, Toronto Zoo, Mountain View Conservation Centre, Grouse Mountain Refuge for Endangered Wildlife, Simon Fraser University, University of British Columbia, BC Conservation Foundation, and Fraser Valley Watersheds Coalition. In addition to ongoing support from the partners listed above, primary funders include: The Government of Canada Habitat Stewardship Program and Inter-departmental Recovery Fund, Habitat Conservation Trust Foundation, Wildlife Preservation Trust Canada, Endangered Species fund of Canadian Wildlife Federation, US Geological Survey State Wildlife Grant, Canadian Aquarium and Zoos Association among others. Our ex situ work with the two threatened Geocrinia species from the south-west of Western Australia (Critically Endangered White-bellied Frogs, Geocrinia alba, and Vulnerable Orange-bellied Frogs, Geocrinia vitellina) has continued throughout 2011. A captive breeding program for the White-bellied Frog, Geocrinia alba, has been established at Perth Zoo to further increase the numbers available for release. Photo: Perth Zoo. The number of sites where White-bellied Frogs are found in the wild has declined by 30% over the past 10 years, while Orange-bellied Frogs are restricted to a small number of populations in a range of less than 6 square kilometres. Since 2008, Perth Zoo has been working with the Department of Environment and Conservation collecting egg nests and tadpoles from the wild for rearing at the Zoo and release back into the wild. We have also established a captive breeding program at the Zoo to further increase the numbers available for release. With the support of the South West Catchments Council, the aim is to re-establish populations in areas where they have become extinct and establish new populations in suitable habitat. This year, we tried a different approach to cycling and breeding the two Geocrinia species, and, in August, we successfully bred the White-bellied Frog for the first time in captivity. A total of three clutches were laid in the breeding chambers during August and September. The eggs in one nest failed to develop but fertile eggs from the other two nests have already metamorphosed and are growing well. In the wild, Geocrinia egg nests are subject to high levels of mortality, due largely to predation by invertebrates, so head-starting them in captivity protects them through this highly vulnerable stage. This year, we released head-started individuals of both species into the wild in early October. While the White-belled Frogs bred at Perth Zoo in 2011 won’t be ready for release until 2012, egg nests collected from the wild in 2010 were ready in October for release after 12 months of careful rearing at the Zoo. A total of 31 White-bellied Frogs were released near Witchcliffe in the south-west of Western Australia at the same site that we released 70 head-started individuals in 2010. Based on monitoring carried out by the Department of Environment and Conservation, we estimate that approximately 50 of the 70 individuals released last year are still present at the site. This is an excellent outcome, particularly given the poor wet season last year and the long, dry summer. We hope that the additional frogs released at the site this year will contribute to the establishment of a self-sustaining population. We also conducted the first release of head-started Orange-bellied Frogs, at a site identified by the Department of Environment and Conservation. While we were in the field to release the frogs, we also carried out the first of three trips to collect egg nests of both species to bring back to the Native Species Breeding Program at the Zoo for the next round of head-starting. In total, we collected five White-bellied Frog nests and eight Orange-bellied Frog nests. Although the average clutch size for these species is 10 – 12 eggs, several of the clutches we collected this year only contained a few fertile eggs. These are currently growing and developing well though, and we already have our first metamorphs for the year from wild-collected egg nests. San Diego Zoo Institute for Conservation Research recently released 300 fertile Southern California Mountain Yellow-legged Frog eggs and 300 tadpoles into the same area where additional eggs and tadpoles were released in 2010. Photo: San Diego Zoo. The San Diego Zoo Institute for Conservation Research has been a partner in the Southern California Mountain Yellow-legged Frog recovery program for five years and we continue to make progress in our captive breeding and reintroduction efforts. Forty-one adult frogs are currently housed at the Institute and we have improved our breeding success every year since our first successful breeding event in 2009. In 2010 we released 30 fertile eggs and 36 tadpoles that had been bred in our conservation building into the Hall Canyon on the UC James Reserve. In June 2011 we released 300 fertile eggs and 300 tadpoles into the same area. Since the first release we have been conducting regular monitoring of the release site. Amphibian larvae have a very low natural survival rate to metamorphosis, with only 5-10% of tadpoles expected to survive to become frogs. Predators such as aquatic invertebrates and garter snakes play a big role in reducing tadpole survival. In early fall of 2011, Zoo scientists were very excited to find a number of tadpoles from that year’s release in the creek. Many more may have survived but mountain yellow-legged tadpoles and frogs have evolved coloration and behaviors that allow them to be camouflaged very well, making it very difficult for humans to see them. The San Diego Zoo Institute for Conservation Research will continue to breed our captive frogs annually and plans to reintroduce more tadpoles in 2012 with the goal of establishing a new population of frogs at Hall Canyon, where they were once a common sight.